I also headed to the Dulwich Picture Gallery, for my second Art Pass freebie. John Soane's building is the star, now over 200 years old, but the permanent collection inside is pretty fabulous too. I'll not detain you by discussing the paintings, but I will tell you what it was like to be the only art-going visitor. Bloke on Front Desk: Ah, you have an Art Pass. I would ask you to stump up £8 extra for our special galleries, but I'm afraid we're 'between exhibitions' at the moment. Bloke on Front Desk: Hang on while I print you a ticket saying £0.00. Curator: You two, this way please, through the shop. Third Gallery Assistant: Oh hello, I'm here now, am I due on? Events Manager: Let me show you round to see if this is the right venue for you. 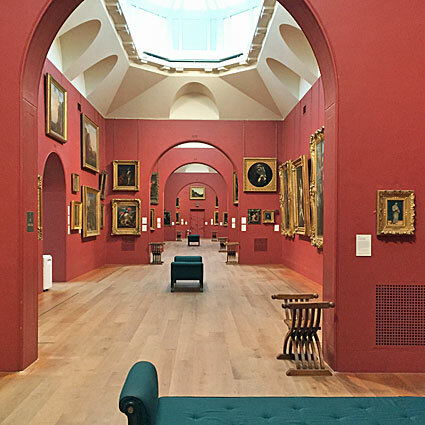 Events Manager: We can seat 120 people down the main gallery using a very long table. You can't serve alcohol near the paintings, so we have a red line where guests have to put their glasses down on a table. We have an approved list of suppliers. The building makes a lovely backdrop to photos, but flash photography isn't allowed. Would-be Event Organiser: Do you have availability at Christmas? Only Visitor: Well the art was wonderful, I wonder when the next bus is. Curator: Roll on 13th February when the Norwegian exhibition kicks off and the visitors come back.